Available from Doubleday in paperback, audio, and ebook! The Pinkertons branded her a crafty blackmailer, but to her Dutch Baron husband she was the most glamorous woman to grace Europe’s shores. Was the real May Dugas a cold-hearted enchantress, an able provider for her poor family, or a free-spirited globe-trotter? 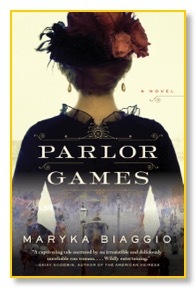 PARLOR GAMES is based on the true story of the woman who made headlines not only in her Michigan hometown, but also in New York and London.